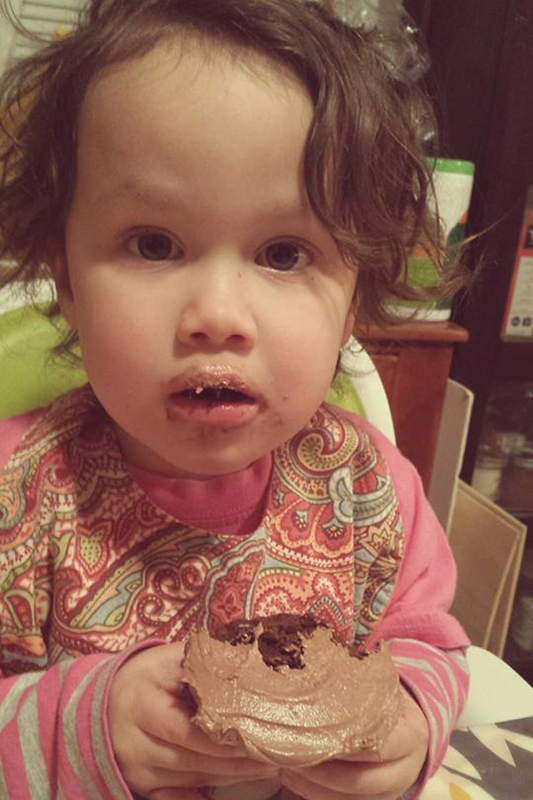 would this face lie about a cupcake? Life, in general, is not easy. Life with a toddler, specifically, is not easy. Especially when it comes to matters that concern the safety of said toddler, life is not easy. Toddlers don’t understand that you don’t run out into the street….everything is a game of catch me. Toddlers don’t consider that a car may come around the corner at any second when they decide to park their bottom in the middle of the road…walking from the car to the house takes a lot out of you and sometimes you just need to rest, geez momma. Toddlers, much like Honey Badger, don’t care. But as their parents, we do. So it is that I’ve been on the hunt to repair the fence in our front yard. Thanks to the driving skills of our neighbors, our fence has been hit, banged, knocked, and generally whacked out of service. The posts are so far out of alignment that the gate can’t latch closed, the top rail isn’t connected to anything, and the chain link itself has pulled away from the posts leaving huge gaps. Exactly the kind of gap that a toddler can use to make a break for it. With the promise of a thaw from this endless winter, at some point we will want to be out in the front yard. But before that can happen, the breach must be secured. Never, in my wildest imagination, did I expect to pay nearly two month’s worth of mortgage payments for some metal posts, chain link mesh, and a gate. And yet I am about to sign a contract to do just that. If it gives me one less thing in life with toddler to worry about, I’m all for it. And when you come visit me in the poor house because I’ve gone broke paying for the fence, please bring these cupcakes. They are easier than most moments of life with toddler….and they are pretty freaking delicious. I’m already planning on making these for Miss Libby’s birthday. They are what my memory says is a perfect birthday cake…moist, tender, and frosted with indulgence. Seriously, my frosting was almost too sweet because for some reason I only used 1 ounce of unsweetened chocolate. For more balance, use the full 2 ounces. BAH Note: According to The Smitten, this makes one dozen cupcakes or one 8 OR 9 inch cake, so plan accordingly. The Smitten also provided both volume and weight measures, so they are below. But if you ask me, it’s so much easier to weigh out your dry ingredients….because hello, precision. But you use what you’re most comfortable with. Heat oven to 350 degrees, place paper liners in a cupcake pan, and lightly grease the top of the pan with a little butter to help get the baked cupcakes out with minimal resistance. Combine the flour, cocoa powder, baking soda, baking powder, and salt in a medium bowl and stir with a fork or whisk to combine and break up any clumps of cocoa powder. In the workbowl of your stand mixer, cream the butter and brown sugar on medium speed until fully combined and fluffy. Reduce speed to low and add the egg, egg yolk, and vanilla and mix. Add the buttermilk and mix until combined. The batter might look curdled at this point, and that’s ok. Slowly add the flour mixture and mix on low speed until almost just combined. Scrape down the sides of the bowl and give the batter a final mixing by hand to make sure there are no dry streaks of flour hiding at the bottom. Spoon or scoop the batter into the prepared muffin tin and bake for 18 to 22 minutes, until a toothpick inserted into the center comes out clean. Let cool for 10 minutes in the pan and then flip the cupcakes out onto a rack to cool completely before frosting. Combine the melted chocolate, salt, and butter in a medium bowl and use a hand mixer to beat until smooth. Add the powdered sugar and mix on low speed until fluffy. Add the milk/cream/half and half to thin the frosting till it’s to your liking and then turn up the speed on your mixer for a minute for maximum frosting fluffiness. Spoon or spread the frosting onto the cooled cupcakes and try not to gobble them down all at once….easier said than done. Celebrating an afternoon spent with friends and indulging in laughter, retail therapy, and insanely good biscuits. Celebrating progress getting Miss Libby into a new sleep routine. Celebrating friends who love my child enough to read the same story over and over and do it in character voices. Celebrating plans that go awry but end up working out the way they were meant to all along. Celebrating glorious summer days where the trees dance in the breeze and the windows are open. Celebrating the generosity of others who share their bounty with me. Celebrating the support of friends and family who remind me that I’m not in any of this alone. Does it get much better than that? BAH Note: This is what happens when I buy peaches but don’t have time to wait for them to ripen enough to eat. I start looking for what else I can do with them. This particular time I had a perfect bunch of basil and a pint of blueberries. I just threw them together and let the heat of the oven work its magic. You can use whatever combination of fruit you have (peaches, plums, berries, cherries, whatever floats your boat) so where I called this Peach Blueberry Basil, you might call it something else entirely. It goes without saying that if Basil ain’t your thing then skip that ingredient. 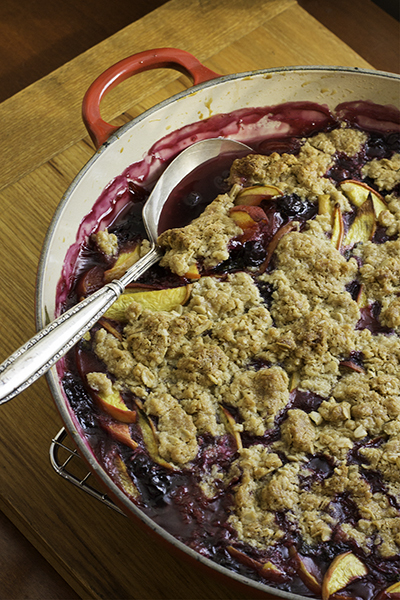 And word to the wise, put your dish on a baking sheet…bubbling fruit juice is rocket hot and that’s no joke. 1 cup sugar (if you want to get fancy, put the basil and your sugar in a small container, cover, give it a good shake, and then let it sit for a hour or so to allow the basil to infuse the sugar and the sugar to sort of crystallize the basil). Heat your oven to 375 degrees. Working in short pulses, combine the flour, brown sugar 1/4 teaspoon salt, and the oats in a food processor. Add the cubed butter and continue to pulse until the butter is fully combined and no dry spots remain in the mixture. If you put the basil in your granulated sugar, remove the basil, use your thumbnail to tear it into small bits, return it to the sugar, and give it one more good shake. Place the fruit, granulated sugar, corn starch, basil, lemon juice, and 1/2 teaspoon salt in a large bowl and stir until fully combined. Transfer the fruit to a baking dish and top with the oat mixture. Bake for approximately 60 to 70 minutes or until the juices bubble and the topping browns. Allow the crumble to cool for about an hour before digging in. I’ve been hiding something and I need to finally set it free…I am impulsive. There, I said it. My impulsiveness comes in two different flavors. There is the entitled impulsiveness like when I see a little something that makes me WANT it in the same way that my child WANTS damn near everything (as two year olds do). That led to an embarrassing amount of consumer debt as I tried to keep up with all of The Joneses around me. And I’m hard pressed to recall one single thing that I absolutely HAD TO HAVE in those moments. Thankfully, that debt has been retired and I strive to be more mindful about the why when I feel WANT’S manic urge creeping up on me. There is a productive impulsiveness that compels me to DO. I’ll see a project and I simply won’t rest until I start working on it. That would explain the random assortment of craft related items overtaking the limited storage space in my tiny house. See, I’m better with the starting the projects than I am with the finishing. For example, Libby just turned two and I have yet to finish creating the first year of her baby book. But then again, this is the impulsiveness that gives me a creative outlet and I’ve got one hell of a nice felted wool blanket as proof that sometimes I stick it out and see a project through from start to finish. Although maybe I am actually hounded by a third kind of impulsiveness…a hybrid of the WANT and the DO (WAND? DONT?) This is the torment that comes from seeing something that I WANT (NOW!) and then focusing on how and when can I DO it. And I mean a singular focus on when I can DO it. Almost obsessive. That’s how I came to experience Homemade Magic Shell. That recipe showed up all around the internet and every time I saw it I wanted it desperately. It made me pretty crazy until I could find the time to make a batch. It was that itch that you just can’t reach no matter how much you stretch your arm behind your back. And then, one day, it happened. I melted, cooled, and drizzled. And I decided sometimes impulsiveness tastes like chocolate. BAH Note: Scale this recipe to your liking. I like it too much to keep much of it on hand in it’s magical form so I only make this wee batch. Combine the ingredients in a microwave safe bowl. Microwave on high, stopping to stir every 15 seconds, until the chocolate and coconut oil are melted. Carefully remove from the microwave and stir to combine thoroughly. Once cooled to room temp it will magically firm up when you drizzle it over ice cream. Any leftovers should be stored in an airtight container at room temp. What kind of crazy made me think it was reasonable to order my child’s birthday present six days before her birthday and expect to get away with it? The kind of crazy that comes from sleep deprivation. Who in their right mind orders their child’s present three times, from three different vendors, and pays for expedited shipping, counting on at least one of them to show up in time? Nobody in their right mind, obviously. And that would be the same kind of mindless crazy that made me think I needed to see if I would like a brownie ice cream sandwich recipe. I can’t believe I even considered such a question. Seriously, what the hell was I thinking? 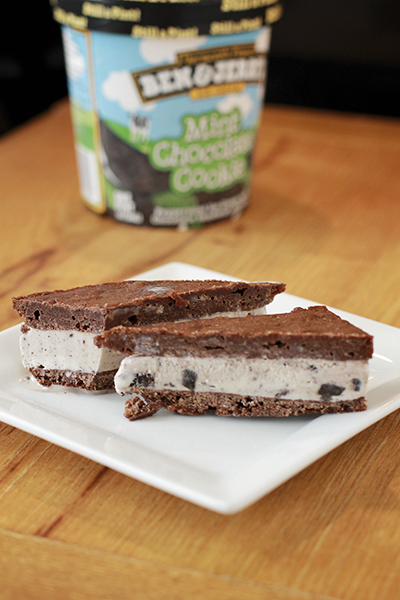 Brownie + ice cream = classic. It’s the dessert equivalent of a little black dress. I don’t yet know how the birthday present situation is going to end. Two of the three orders have been cancelled and Amazon SWEARS that the Peppa Pig Playhouse will arrive in two days. Only time will tell. What I do know is that I need to exercise restraint when it comes to this brownie ice cream sandwich because it is ridiculously easy to make and it got enthusiastic thumbs up from every member of the household. Which means it could make frequent appearances in our home. Which means I might have easy access to brownies and ice cream on a regular basis. I think I gained five pounds just considering that possibility. BAH Note: Deb used 8 inch square pans to bake her brownie layers. I used 9 inch round pans, because that’s what I have in my kitchen. Either one will give you thin brownie perfection. Since I used round pans, I turned a big circle into a square by cutting off the curves after the layers had been sandwiched together and frozen. Those scraps may have been nibbled on to get a quick fix when nobody was looking….what you do with them is between you and your conscience. Be sure to smooth out the batter as much as possible in your pan. It’s pretty thick and takes some gentle convincing to cover the bottom of the pan. Oh, and you need to clear space in your freezer to stash the cake pans as soon as they come out of the oven and to store your finished product. Heat your oven to 350 degrees and line two cake pans (see note above) with baking parchment. Melt the chocolate and butter in the microwave, cooking in 30 second increments and stirring in between. Add the sugar and stir until completely combined before stirring in the eggs and salt. Add the flour, folding it into the batter just until it disappears. Spray your parchment lined pans with cooking spray and divide the batter between the two pans. Use a spatula or spoon to smooth the batter out in the pans and bake for approximately 12 to 15 minutes or until a tester inserted in the brownie comes out clean. Place the cake pans on a dish towel or pot holders and transfer to the freezer for approximately 20 to 30 minutes for the brownies to cool completely and become firm. While the brownie layers cool in the freezer, set your ice cream out to thaw a bit. Once the brownie layers have cooled, gently remove the brownie from one pan, peel off the parchment, and set the brownie on a plate. Use a paper towel to wipe the cake pan clean and line it completely with parchment, freezer paper, or plastic wrap making sure it extends up the sides. Return the brownie layer to the pan, placing the flat smooth side up facing you. Remove the brownie from the second pan, discard the parchment, and set the brownie on a plate. Working quickly, stir your ice cream so that it is spreadable and spoon or scoop it into your prepared pan. Use a spoon or spatula to spread the ice cream into an even layer on top of the brownie. Top with the second brownie, flat side down, and cover the top of the pan with plastic wrap. Use the now empty cake pan to press down on the layers and return the stacked pans to the freezer. Freeze for 45 minutes to 1 hour or until your sandwiches are completely frozen. Use the parchment, freezer paper, or plastic wrap extending up the sides of your pan to remove the giant sandwich from the pan, transfer to a cutting board, and cut into single servings. Did you know that cupcakes can be so good that they need protection? They can. These are. Let me tell you how they came to be. After stumbling across Movita Beaucoup’s delightful blog, courtesy of More Stomach, I added her feed to my reader. Not long after that she had the nerve to post a recipe for one bowl yellow cake with lemon buttercream frosting. Now I do love me a one bowl recipe as evidenced by my sworn allegiance to Abby Dodge’s Emergency Chocolate Cupcakes, so I had to investigate the Beaucoup. Luckily, Easter presented an opportunity to give them a go and they instantly won me over. The cake is pillowy soft with an enjoyable tang from the buttermilk. It makes a perfect canvas for whatever flavors you want to showcase. For Easter I threw the zest of one lemon into the cake batter and then made a strawberry lemonade frosting. They were a homerun. Me: I can’t make a damn decision about what to bake for Cousins Birthday on Friday. 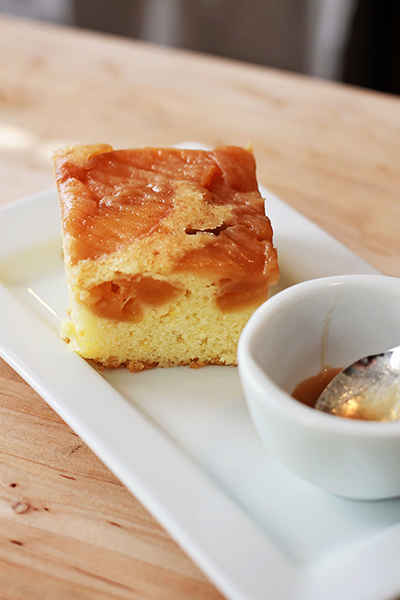 Here’s the options….how about you pick: Apple Upside Down Cake; Peanut Butter and Jelly Bars; Caramel Apple Muffins; One Bowl Yellow Cake with Lemon Buttercream Frosting. Jen: Looking at recipes…I’m leaning towards the yellow cake or the pb&j bars! Me: What do you think about the yellow cake with a jelly filling and peanut butter buttercream frosting? Jen: Ummm. Amazing. Omg. 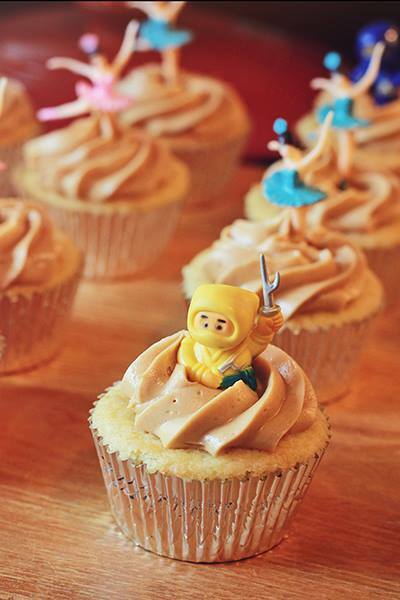 Pb frosting. You’re a genius! So it was that I set about turning the easiest yellow cake into an homage to the classic pb&j sandwich. I kept strictly to the cake recipe….no tweaks, no additions, no deviations. Once the cupcakes had cooled, I used my favorite unitasker to make a hole in the middle for the jelly to hide…and those little cupcake cores may or may not have become a perfect little snack as I filled and frosted. Next came the jelly and a generous dollop of peanut butter frosting. All that was left to do was keep them safe until after dinner and shove them in our faces. BAH Note: I had to make a second batch of cupcakes because I overfilled the tin on my first batch which caused me to overbake the cupcakes and completely mangle the goods trying to get them out of the pan. Learn from my mistake and don’t fill your pan any more than half full. I ended up using about two tablespoons of batter per cupcake in the second batch and it was spot on. I lost track of exactly how many cupcakes I got but this recipe will make approximately 12, or a single 8 inch round cake. 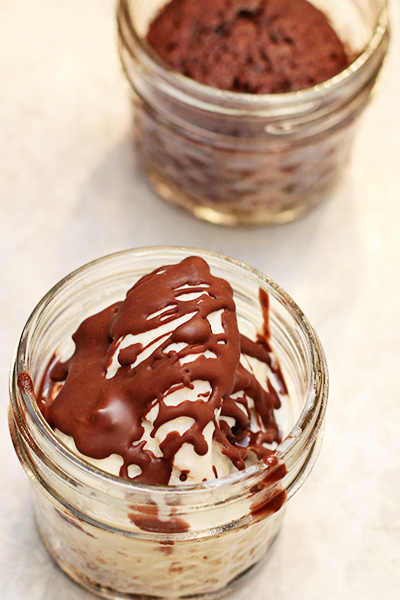 If you have a little batter leftover after filling your pan, drop cupcake paper into glass jars or custard cups and make a few extras for snacking…nobody has to know. Line a cupcake tin and heat your oven to 350 degrees. Combine the flour, sugar, baking powder, and salt in the workbowl of stand mixer fitted with the paddle beater and mix on low for about one minute. Add the butter and mix on low for about two minutes until the mixture resembles sand and no large bits of butter remain. Add the buttermilk and vanilla and mix for about two minutes, scraping down the side of the bowl occasionally. Add the egg and mix until combined. Use a spatula to scrape down the sides and bottom of the bowl and give the batter a final mix to ensure no pockets of flour remain. Fill each cup with approximately 2 tablespoons batter and bake for approximately 20 minutes or until a tester inserted in the center of a cupcake comes out clean. Cool in the pan for about 15 minutes then remove the cupcakes from the pan to cool completely. Remove a small core from each cupcake and fill the hole with your choice of jam, jelly, or preserve before topping with frosting. Place the powdered sugar, peanut butter, butter, vanilla and salt in the bowl of an electric mixer fitted with a paddle attachment. Mix on medium-low speed until creamy, scraping down the sides of the bowl as needed. Add the cream and beat on high speed until the mixture is light and smooth. I hope that you will always have golden summer moments like this one. BAH Note: These pops are ridiculously easy to pull together. Just remember that they need time to do their thing in the freezer before they are ready to serve. Of course, you can skip the pop part and just dive into the bowl of pudding. Either way, you really can’t go wrong. Many thanks to Theresa of The Craving Chronicles for introducing me to Dorie Greenspan’s pudding recipe. My apologies to Ms. Greenspan for monkeying with her process to make it fit my style. Regardless of how I got there, the final product may change my life, or at least my waistline. Combine the butter and chocolate in a microwave safe bowl and microwave in 30 second increments, stirring between each, until the chocolate is melted. Stir to completely combine the melted butter and chocolate and set aside. In a medium bowl, combine 1/4 cup of milk, vanilla, 3 tablespoons sugar, cornstarch, egg and yolks. Add the remaining ingredients (2 cups milk, 2 tablespoons sugar, cocoa powder, and salt) to a medium saucepan. Whisk until the cocoa is thoroughly combined and the liquid looks like chocolate milk. Cook over medium heat, stirring occasionally until the mixture just comes to a steam. Working in several small batches, whisk 1/2 cup to 1 cup of the steaming milk mixture into the egg mixture and stir to combine. Whisk the warmed egg mixture back into the saucepan and continue to cook over medium heat, stirring often, until the pudding thickens. Remove from the heat and pour through a fine mesh strainer (to catch any bits of cooked egg) into another bowl. Whisk in the melted chocolate mixture and stir until fully combined. Cover the bowl with plastic wrap, pressing it down onto the top of the pudding, and refrigerate 4 to 6 hours or until completely chilled. Spoon the chilled pudding into your molds and freeze. Let the pops sit at room temperature for 10 to 15 minutes before serving. Community Supported Agriculture (CSA) is a mutually beneficial relationship between farmers and the community. Participants provide funding for the farmer in advance of the growing season in exchange for produce when it’s ready. Items vary according to the season. They could be beets, lettuce, potatoes, tomatoes, a watermelon — whatever is ripe for picking. Sounds like a win-win, right? As much I want to say the answer is yes, I can’t. Because a traditional CSA obligates you to participate every week for the length of the season. Considering that I don’t know what life is going to throw my way from week to week to week, how in the world does it makes sense for me to commit to 24 weeks of anything, let alone produce buying? Not to mention the fact that despite my best intentions, sometimes the produce I bring home doesn’t get used up in a week. It often lingers and takes up the limited amount of storage space in the crisper and on the counter. If I manage to line up a weekend get away, I can skip my pickup but I’ve still paid for that week. So in the larger picture the produce just got more expensive on a per item basis. Selection flexibility varies by grower. Some prepackage the shares which means that you get what you get. Other growers allow you to pick your items week to week from whatever they have available. There is no set guideline so it is up to each CSA to decide how much flexibility you get in selecting your items. Did I mention that you pay up front for your spot? Prices vary but a full share (typically 6-8 selections per week) will run between $500 and $600. Averaged out, it’s about $20 to $25 per week which certainly is a great value. But I would be hard pressed to come up with that kind of cash in a single transaction. Sure you can sign up for a half share for a slightly lower cost or split a share with someone. And some CSA’s even allow you to pay the cost in three or four payments. Personally, cost has been probably the biggest factor preventing me from really jumping on the CSA wagon. My last issue with CSA’s is that the pick up isn’t convenient for me. Could I get myself to the farmer’s market at 8am on a Saturday? I suppose. But I’m not inclined to. Could I arrange to get to a pickup location on a weekday? That’s even less likely given that I’ve usually got a small person in tow and at the end of the work day, neither of us wants to sit in rush hour traffic to pick up some veg…we’d rather go home and veg. These are the reasons that I have poo-pooed CSA’s. But then I stumbled across a CSA, on Facebook of all places, that seemed like it had been created just for me. There’s no long term commitment. I get to decide from week to week if I want to purchase anything. That alone makes me giddy. No long term commitment means that I pay as I go. So I don’t have to come up with a chunk of cash to “secure” my share at the beginning of the growing season. That makes my checkbook happy. There are multiple share sizes…fruit share, vegetable share, half share, full share, double share, dairy share, egg share. The choices are almost dizzying. So I’m able to select the option that is right for me. As if that wasn’t enough flexibility, I can request a substitution here and there. If they can accommodate the request, they do! In my last pickup, I was able to sub out two butternut squash for the week’s kale and watermelon…I totally got the better end of that. And if I want to add some a la carte items, I can do that too. I’ve come home with local butter, bacon, and berries thanks to a bit of impulse buying at pick up. As if that wasn’t enough to arouse my interest, I get a three day pickup window. All I have to do is say which day and be there between Noon and 7pm. Seriously, even I can fit in a ride down the highway at some point on a Saturday or Sunday….sometimes even a Monday if the stars align. That makes my overprogrammed schedule happy. My discovery of this Wendi-friendly CSA is how I came to be in possession of a crate of local Honey Crisp apples. On a weekday afternoon. At home alone. When The Universe gives me this kind of gift, you better believe I take full advantage of it. So I pulled out a recipe for Apple Cake with Caramel Sauce and got peeling, chopping, and baking. I may have taken a few liberties with the recipe and had a complete fail on my first attempt to get the sugar to cook into caramel, but I reveled in the luxury of having the freedom to get my hands, and my pans, dirty, and in finding a CSA that works on my terms. BAH Note: Bon Appetit gave this a fancy French name but when you strip away all the fancypants Francais, it’s an apple upside down cake. I think the cake shines brightly enough on its own that I’m saying the caramel sauce is optional. If you’d like to exercise that option, click on the link to Bon Appetit above and you can access the caramel sauce recipe. Heat oven to 350 degrees. Line a 9″ round cake pan with parchment. Butter and flour the pan and set aside. Melt 2 tablespoons butter in a large skillet over medium heat. Add apples and 2 tablespoons sugar and cook until the apples become golden brown, approximately 10 to 20 minutes, stirring occasionally. Allow the apples to cool slightly while you prepare the cake batter. Whisk together the flour, 1 cup sugar, baking powder, salt, and lemon zest in a medium bowl. In a separate bowl, whisk together the eggs, melted butter, and vanilla. Pour the egg mixture into the flour mixture and stir until just combined. Spread the apples into the bottom of the prepared pan. Pour the batter over the apples and bake until a tester inserted in the center of the cake comes out clean, approximately 35 to 45 minutes. Transfer the cake to a rack to cool for about 10 minutes. Flip the cake out of the pan onto the rack, remove the parchment, and allow the cake to cool completely.